We were at a pre-wedding family get together in New Zealand some years ago, right before one of the Husband’s sisters got married – and I was checking out the buffet table. It was the first time that we had met her future husband’s clan, with all the slight awkwardness that implies, and there’s no better way of getting someone’s measure than seeing what food they make for company. I was in luck. As I made conversation with one of the husband-to-be’s American aunts – incredible woman, incidentally, worked in post-Cold War Russia and a lot of other fascinating international hotspots – I spotted a plate, piled high with neatly piped, white and yellow Devilled Eggs. While I had loved the name of the dish as a child, first coming across them in old recipe books like Maura Laverty‘s Full and Plenty from 1960, I never made them. I was what you would, if you were kind, call a “picky child” and the idea of voluntarily eating an egg yolk didn’t occur to me until I was in my 20s (see also: Potatoes – the whole sorry story…). But there they were, amongst the cold cuts and bread rolls and salads. How retro! How Mad Men-esque! And my, how good they tasted! 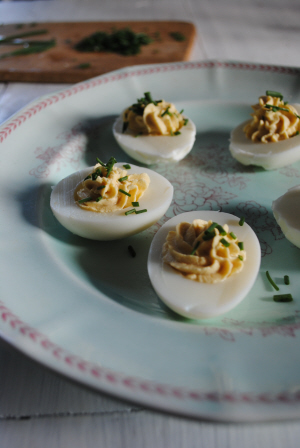 Perfect for sunny Sunday night suppers when it’s just too hot to eat boiled-egg-in-an-eggcup. Normally these are made with mayonnaise instead of yoghurt but, especially on a hot, humid day, I like the tangy light flavour that you get from the yoghurt. They are also good with a pinch of curry powder. And remember: the better the eggs, the better the results. Put the eggs into a saucepan, cover with cold water to a depth of 2cm and bring to a boil over a medium heat. As soon as the water starts to bubble, set a timer for 7 minutes. Plunge into cold water immediately, cool for 10 minutes then carefully remove the shell. Cut in half lengthways. Carefully remove the yolks and mash with the yoghurt, vinegar, olive oil, mustard, Worcestershire sauce, hot sauce and season to taste. Simply spoon the mixture back into the whites or go all domestic goddess on it and use a piping bag. Garnish with a sprinkling of chives and/or a dusting of paprika and drizzle of olive oil. Serve at room temperature. 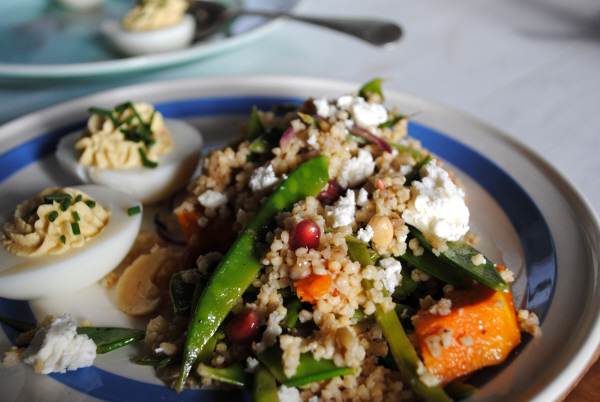 Serves 2, with a big bowl of Millet, Roast Veg & Feta Salad. This seemed to be one of those meals that just appealed to adults. Despite lots of enthusiastic explanations (you should be in my house come suppertime), Little Missy and the Small Girl weren’t interested in eating any retro references.